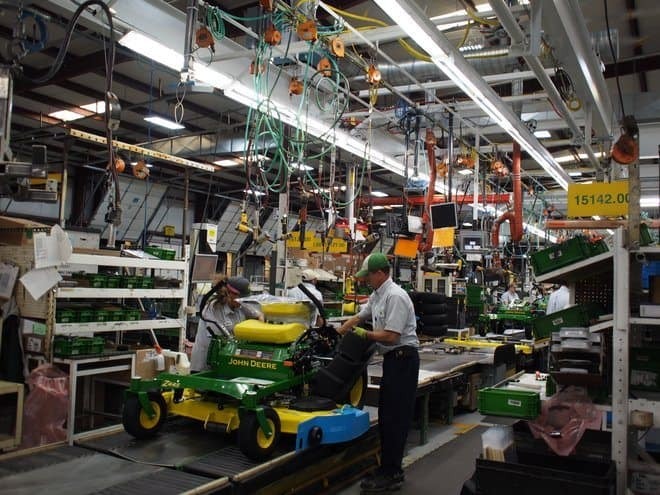 Every 25 seconds a new John Deere lawn tractor rolls off the assembly line at the John Deere plant in Greeneville, TN. That is quite an accomplishment and testament to the precision and efficiency of the team at Greeneville. This is third trip we’ve taken to visit a John Deere factory (and hopefully not the last). We previously visited their August, GA and Horicon, WI, plants and came away very impressed each time. 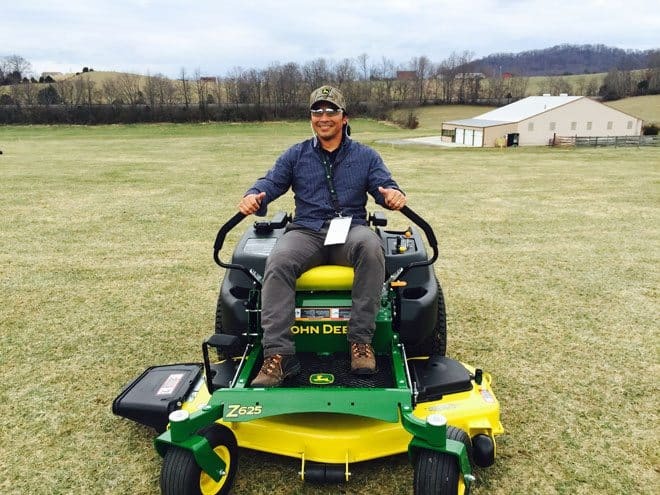 Speed in production is important but John Deere Greeneville holds Safety above everything else. When you’ve got 63 SKU’s to produce in the time that they do, it’s amazing to learn that they have had 5 million straight lost time injury free work hours and before that they had 12 million straight lost time injury free work hours. Statistically speaking you are safer on the factory floor than in your own home. The plant runs at 80-90% below the average for OSHA. Personal and team safety is at the core of their culture, and their culture is unique to Greeneville. In fact the factory was bestowed with the Shingo Prize for excellence in manufacturing in 2010. It’s basically the Nobel prize for manufacturing and they only give out one or two per year. 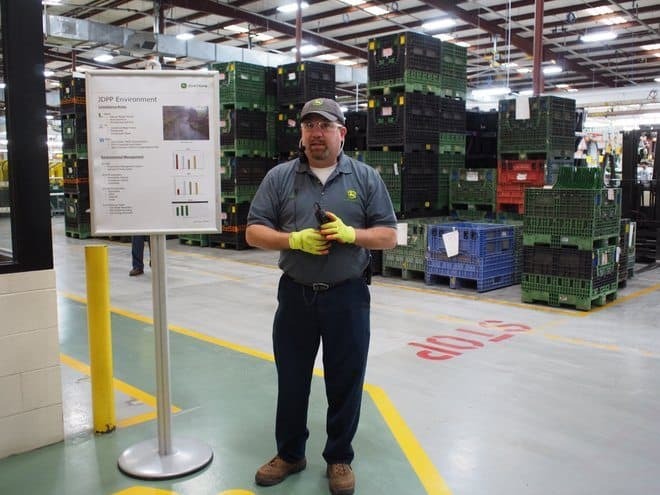 The factory manager, Jeff Hollett, who has been with John Deere for 36 years, has an open door policy and has team meetings weekly that include every employee. He wears a work shirt like anyone else and if all the good parking spots are taken, he has to find one at the back of the lot, just like everyone else. John Deere plants run on a seasonal basis with production being nearly 10x higher in March-April as opposed to September-October. This means they rely heavily on contingent staff during the peak season. These employees are rewarded as they are tied into the same bonus structure as the core employees, so it’s to their benefit to work as safely and as efficiently as possible. This prevents a drop in quality and provides motivation for everyone to work together. The “Made in Greeneville” sticker you see above means a lot to these people and doesn’t get slapped on a mower until they are certain it deserves it. 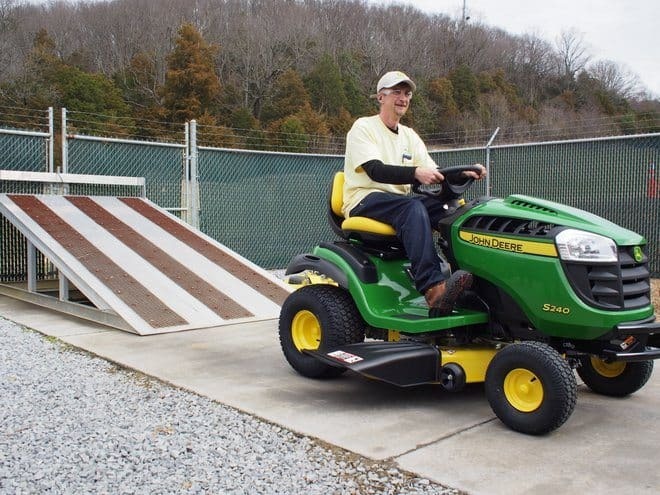 John Deere Greeneville employees are active in the community throughout the year. One of their more impressive programs, helps feed children in need and provides more than 1200 take home food boxes per month. This emphasis on having a strong company culture is what keeps them on target to meet their goals and perform to the best of their abilities. It’s hard not to notice a parallel with Zappos and other tech companies who value culture so much and have thrived by doing so. 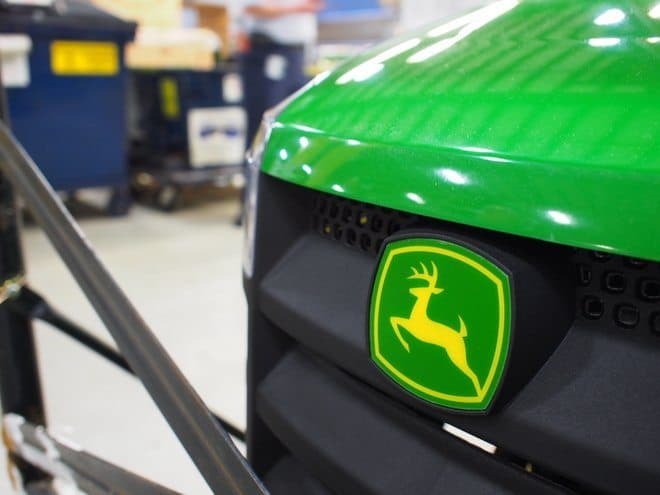 Learning about the culture at John Deere is fascinating, but the real reason to be there is to see how the tractors and built and eventually ride them. Photos and video were limited at the factory but we still managed to get a lot of footage. Our complete photo gallery is online and you can check out some videos from the line at the end of this post. 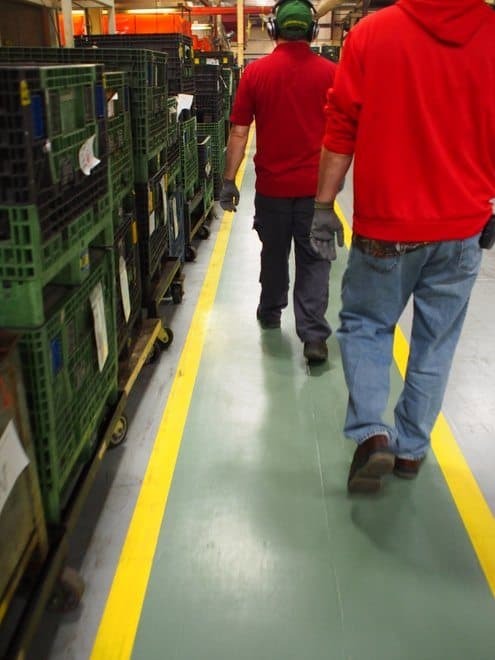 The big takeaway from the factory floor is safety. Even though we were all out of harms way, they still required that we wear hard hats (cleverly disguised under ball caps), gloves, eye protection, and ear plugs. We walked through the factory along the “Green Mile” which they instituted to prevent pedestrian and forklift accidents. 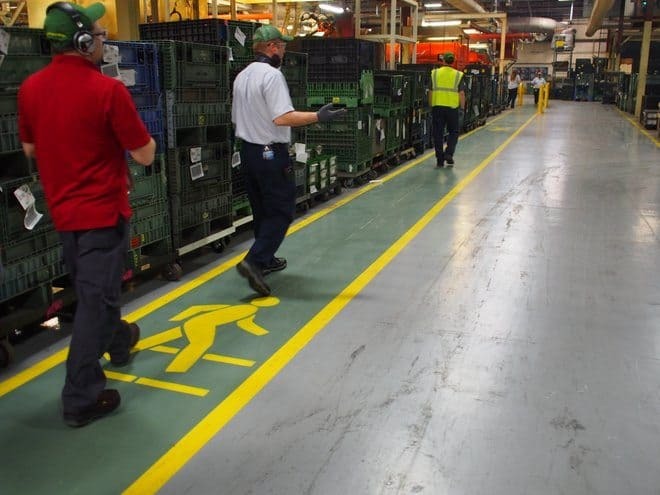 It’s a walkway painted green that winds throughout the factory. They also had placed laser lights on the back of each forklift that shine down on the ground about 10-15 feet behind each forklift. 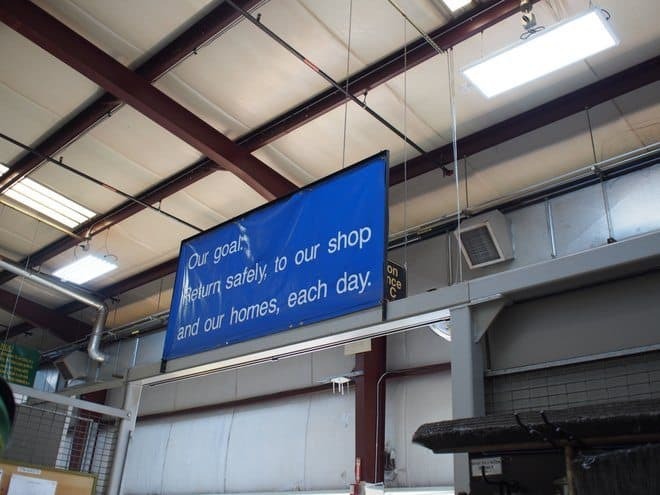 It’s a hard to miss blue light that indicates a fork lift is within range, so in case the fork lift is out of site (behind shelving or a wall), you have an indicator to show that it’s still there and is a danger to walk behind. 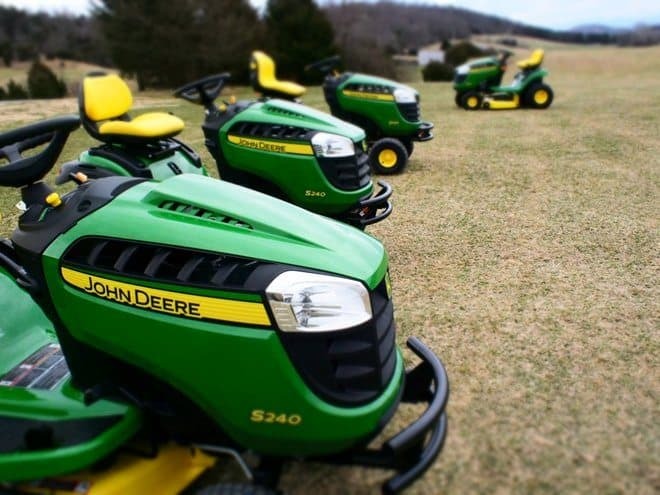 There were three major lines that built the John Deere D100 series, EZTrak zero-turn, and new S240 Sport riding mowers. 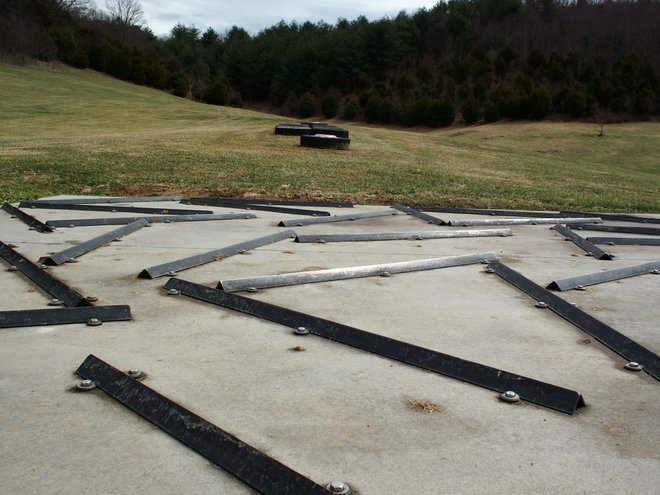 These lines showcase the best in end-to-end manufacturing and the few parts brought in, like the decks, are made or in the case of the decks, stamped, at another John Deere facility. Along the line you’ll see parts being welded, assembled and tested. These tractors literally start from scratch to being started for testing and then shipped out the door. Employees on the line don’t know where these tractors are being shipped and they don’t have a separate manufacturing process for different retailers. The D100 series and EZTrak are built to the exact same specs regardless of their final destination, be it Home Depot, Lowe’s, or a John Deere dealer. 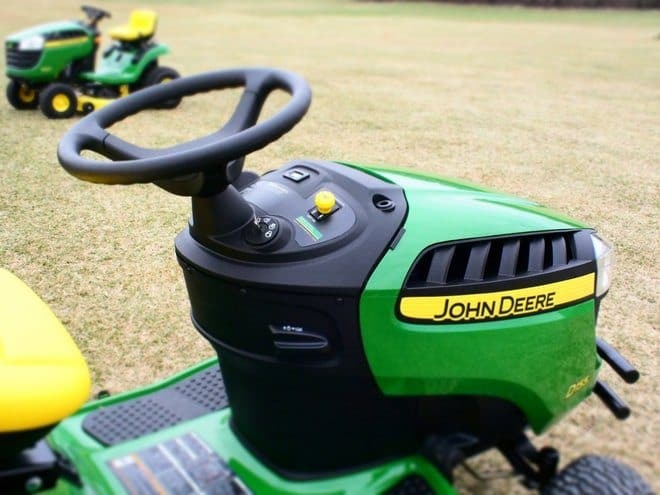 One of the greatest misconceptions is that the big box retailers get “cheaped” out John Deere’s and that’s just not true, I saw it with my own eyes. 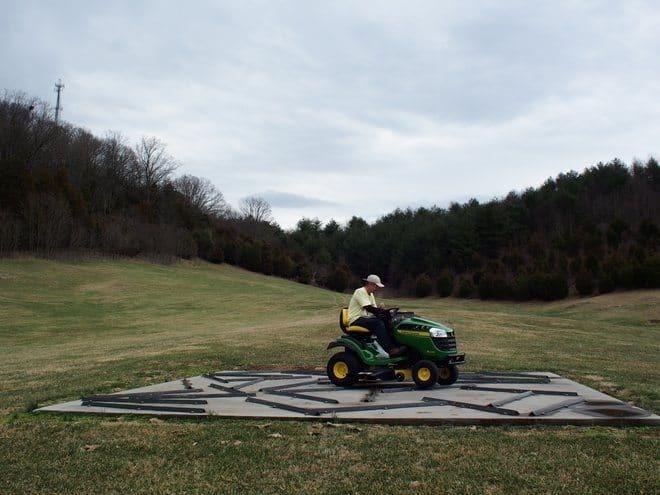 The John Deere testing facility is in Chuckey, TN which is just down the road from the Greeneville plant and nestled on more than 300 acres of rolling Tennessee hills. It’s a gorgeous setting to ride tractors, which is all we were going to be doing, but the daily testers put the tractors through the ringer until their really isn’t much left. The tractors we drove included a D105, S240 Sport and EZTrak 665. They handled the bump track with ease and just flew up and down the hills. The S240 Sport is a new model for this year and they’ve incorporated some premium features into a D100 type body. The creature comforts include a better seat, easier to manage controls, and headlights. 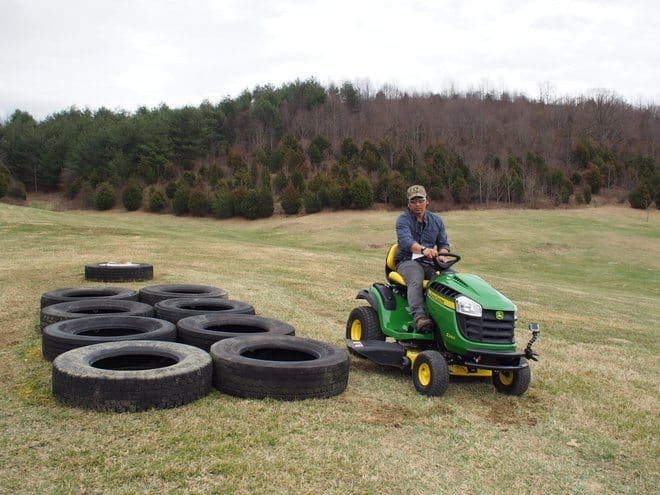 It also has an 18.5 horsepower Kawasaki engine and electronic PTO. The ride was much more comfortable on the new S240 Sport than the D155 and the seat had a lot to do with it. The padding was superior as was the suspension and seat placement which was adjustable. If you are on a tighter budget than the D155 will work fine and has been improved with auto-like pedals and cruise control. The EZTrak models Z435 and Z625 (the one we rode) were also new for this year and the demand continues to grow for zero-turn mowers. Typically these are used by professionals but more and more homeowners who have large flat properties are opting for zero-turn mowers. Thanks to Sarah Findle of IMRE for coordinating this trip and to the team at John Deere Marketing and Sales; Greg Weekes, Kim Ridel, Maureen McCormack, Sean Sundberg and Melissa Lycan. And a special thanks to the folks at John Deere Greeneville; Jeff Hollett, Bobby Jones and the entire staff at John Deere who were the most gracious hosts. Click here for all of our photos.